What would happen if David Hanke, known for his work under the alias Renegades Of Jazz, got into Latin depths? Right, the answer is called: Mankoora. Get involved with the first single release of Mankoora which now sees the light of the vinyl universe. Mankoora members Loopez (Piano & Organ), Alexander ‘Newton’ Bednasch (Bass & Guitar) and David Hanke (production) are coming up on the string to let the world know about them. Mankoora deliver two hot & spicy dancefloor tunes to set the night on fire. 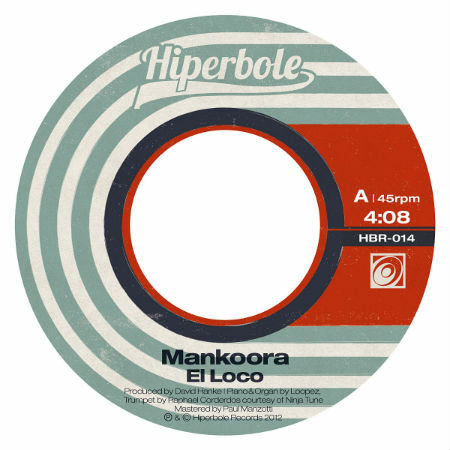 First track “El Loco” sees how Mankoora fuse uptempo breakbeats, driving bass lines, hard hitting horns and a drooling organ to a latin groove that will leave you wanting more. An instant shaker with rich percussion lines and trough drums that won’t leave any last toe-tipper dry on the dancefloor. Flipside is the killer “Boogaloo Tormenta”, a great and relentless piece of music that will get you hooked, strictly for dancers! Introduced by the catching piano line and some great trumpet licks, the song quickly turns into the main vocal hook for ecstatic hip shakin’ and wild fidgeting. The track goes mad with a filthy drum and rhythm break in the middle before turning back to the shakin’ part…. Aired by the likes of Craig Charles (BBC6 Music) and Pete Isaac (Jelly Jazz) the Mankoora outfit already gets massive support from all over the globe.